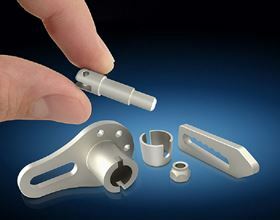 Metal injection molding allows complex titanium parts to be shaped in a single operation. Smith Metals Products says that it has added titanium metal injection molding (TiMIM) capabilities to its MIM range of materials that includes stainless steels, alloys and ceramics. TiMIM involves mixing powdered titanium metal with a binder material to compose a feedstock capable of being handled by injection molding equipment. Metal injection molding allows complex titanium parts to be shaped in a single operation and with a higher volume when compared to traditional titanium machined metal components, the company says. Adding TiMIM capabilities opens a new, wider range of component applications for Smith Metal TiMIM part features can include undercuts, varying wall thickness up to 0.125 inches or 3 mm. TiMIM parts also accept a range of surface finishes including anodizing and electro polishing and can be finish machined if necessary, says Smith Metal Products. This story is reprinted from material from Smith Metal Products, with editorial changes made by Materials Today. The views expressed in this article do not necessarily represent those of Elsevier.